If you’re on a tight food budget, you’re probably scrambling on how to plan a frugal Thanksgiving meal without busting your budget. While Thanksgiving has a reputation for causing our bellies to swell (pass the stretchy pants please!) 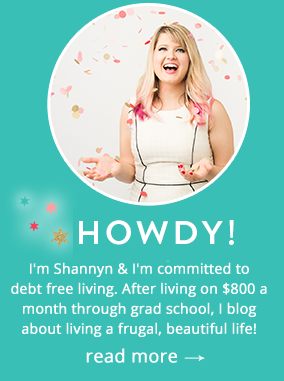 it doesn’t have to swell your budget! I’m type A, and I love to do everything by myself- it is just easier that way, or is it? If someone offers to bring something, LET THEM. If they can help out with a bottle of wine, a casserole or some fresh baked bread, you never know what amazing yumminess they can quite literally, bring to the table. If folks aren’t able to cook, let them bring the centerpieces or plan the dessert. It can cost more to invite people to your party, but if done right, it can help. Split the work and the cost. If every person brings two items (whether a main dish plus cute paper napkins or a bottle of wine), it’s an easy way to curb costs. There is something to say about pretty dishes that makes food look better and cheap wine taste better. If you’re on a tight budget, you can make even a cheap meal look nicer by busting out the finery. You may not have expensive wine, but it will look better (and taste better) aerating in a pitcher. You can prep dessert in advance and re-plate it on your best dishes. Name tags look fancy, but you can easily make them on the computer, or decorate for nearly free with some Thanksgiving printables put in a picture frame. Napkins can be adorned with bakers twine or whatever ribbon you have on hand- it doesn’t cost much, but little touches just take some preparations. You don’t have to hit up the expensive decorations at Target to make it special- you can find some easy inexpensive centerpiece ideas that will be sure to spice up your table for cheap. 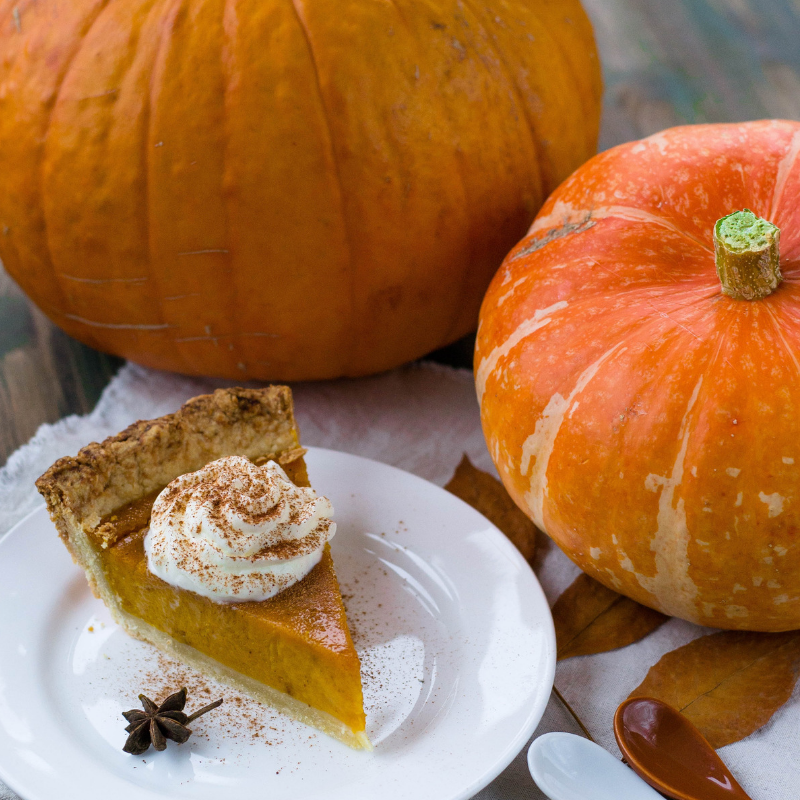 You’ll find some deals on seasonal items to create Thanksgiving day dishes- condensed milk, pie crusts, onion soup, canned vegetables. Stock up for later, and while you’re busy cooking, why not do a double batch of green bean casserole and save some for later? Cook more turkey than you need, and freeze the rest for soup later when your palate isn’t as tired of turkey early next year. Additionally, you can buy in bulk for items that can contribute to your DIY Christmas gifts- flour, chocolate chips, shortening and other baking items like canned fruits are excellent for making edible gifts, or also, a great deal for food drives. Blasphemy! I know, I know. Honestly though, how many of us in our late 20’s really want to make a turkey if it’s just a few of us eating together or you have a tiny kitchen and an even smaller budget! Turkey may not be that expensive for someone who is cooking for a dozen or more people or who snagged a good deal, but if you’re like me and you’re not cooking a giant meal, it’s much easier to have a frugal Thanksgiving meal by skipping the turkey entirely- it can be expensive and wasteful to get all the necessary supplies, a cooking pan and baster if you’re not sold on the idea of cooking a giant bird in a 1 bedroom apartment. Casseroles are a great alternative to cooking a giant bird, but could you consider a Mexican themed frugal Thanksgiving day meal? Dabble in turkey enchiladas or tamales, maybe even some tacos! If there’s a cultural whose food you always wanted to learn how to make- maybe Pad Thai, why not use this day off to really delve into a cultural dish you’ve always enjoyed but not taken the time to learn to cook, it could be cheaper than the super-sized expectations of your traditional Thanksgiving day spread! What’s the best way to save on Thanksgiving? Skip it entirely. 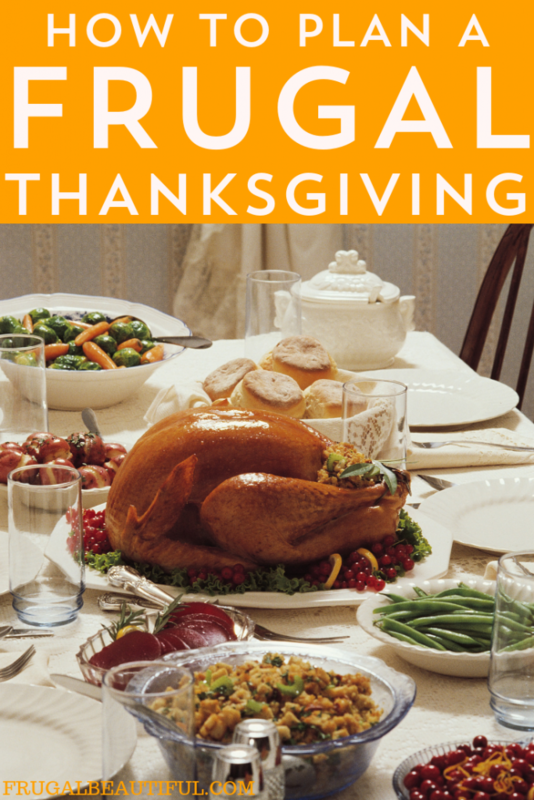 There is no better way to have a frugal Thanksgiving meal or day than to share it with others by doing it with others! Volunteer instead at a local soup kitchen and bring any canned food you won’t be using up before the expiration date and any toiletries you saved from hotels. The best way to give thanks is sometimes simply to share your time with people who are less fortunate. If you find you’re getting stuck in the stress of the season, taking a step back means you can break bread with your fellow man (and wo-man) and simply be grateful for the blessings we do have. Plus, usually, if you volunteer, that means that the bulk of the work is shared, and all the volunteers and patrons can dine together- making it a truly memorable way to dine this Thanksgiving. P.S. Don’t limit your volunteering to homeless shelters or food pantries- is your local animal rescue or hospital looking for holiday volunteers? Is there an elderly care center that could use some visitors? Maybe scoop kibble at a local kennel or bring cheer to a children’s hospital. Check out VolunteerMatch.Org for listings on how you can help. I am still in the phase of life where my parents make the food. I feel very lucky that I just show up and eat (along with all the other grandkids)! I can’t imagine buying all of the food.. If you don’t want to deal with a whole turkey, just buy a breast. My MIL makes dinner for just the 4 of us, so she gets that to avoid too many leftovers. I agree that you should *always* let people bring their own sides to make your life easier. Besides people have their own strange takes on sides. One year, my vegetarian aunt wanted stuffing. So I had to bake a bunch of bread with butter and herbs outside the turkey. That is an awesome tip! For those of us who are cooking for two, a full turkey is just WAYYY too much! I love Thanksgiving food, but it can get expensive very quickly. We try to keep ours frugal by having people bring easy things with them if they offer. Good tips! Aww thanks Cat, and have a great Thanksgiving!